New California Proposal: A More Perfect Union? The "New California" and the just plain "California" proposed by New California. 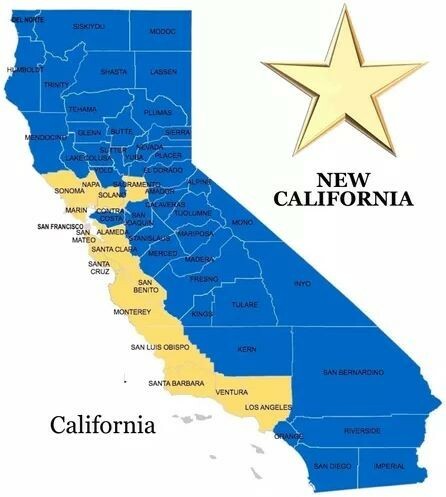 Another move is underway to divide the Golden State, this time with a movement called “New California” issuing a “declaration of independence” this week, garnering news coverage across the country. 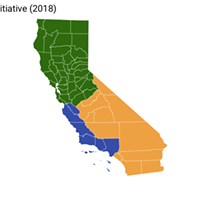 A map on the movement’s website (which has the theme: A more perfect union) shows the proposed “new” state as including most of California’s counties, except those along the coast from Sonoma County south to Los Angeles — or basically all the places with big money. In any event, Humboldt County is listed as an “interested” county by the group, whatever that means. 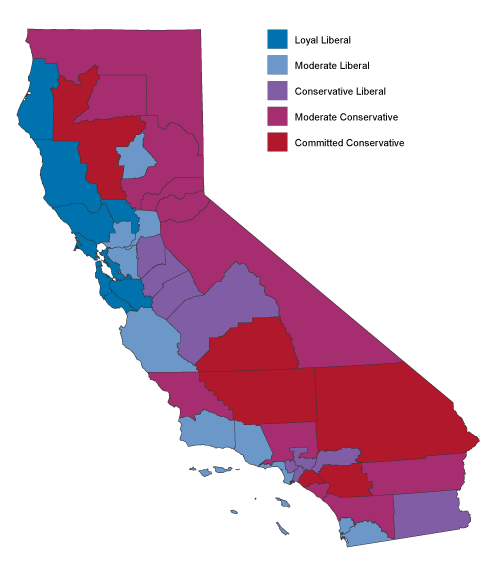 “After years of over taxation, regulation, and mono party politics the State of California and many of (its) 58 Counties have become ungovernable. The nature of the State becoming ungovernable has caused a decline in essential basic services such as education, law enforcement, fire protection, transportation, housing, health care, taxation, voter rights, banking, state pension systems, prisons, state parks, water resource management, home ownership, infrastructure and many more,” the release states. Meanwhile, super rich guy Tim Draper was cleared by the Office of the California Secretary of State back in October to begin collecting signatures for a different proposal, which would divvy up the most populous state in the union into three sections. To make it on the November 2018 ballot, the venture capitalist — now on his second bid to cut up the state (a previous measure to make six parts failed back in 2014) — must now get at least 365,880 registered voters to sign on the dotted petition line for submission to election officials no later than April 23.